These Easy, Gourmet Caramel and Chocolate Rice Krispie Treats are so fun to make AND eat! 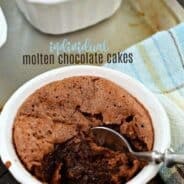 Perfect for birthdays, bake sales, and even a fun snack the kids can help make! Last month my family took a wonderful vacation to Michigan. We looped around Lake Michigan…stopping at some truly beautiful destinations along the way! We headed North from Chicago up through Wisconsin. Our first real stop was the Bay Beach Wildlife Sanctuary in Green Bay, Wisconsin. 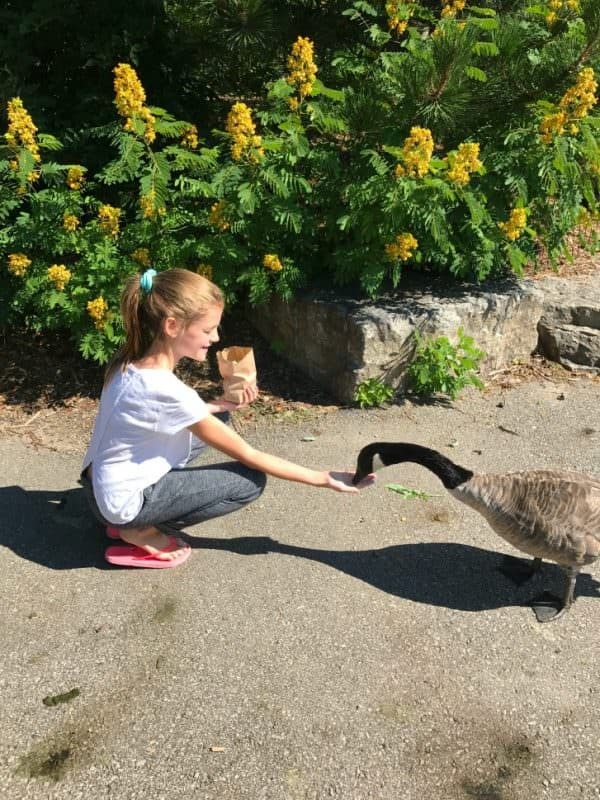 This was such a beautiful place, and my girls LOVED feeding the geese! From there we continued North to the UP, and stopped for a quick photoshoot along the lakefront. We curved around the lake and took a ferry over to Mackinac Island, where we stayed for four days. 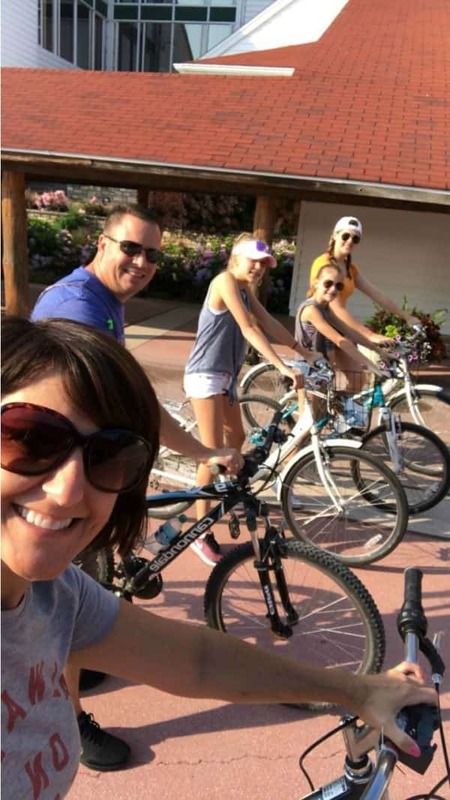 We enjoyed spending our days riding bikes on the island…as there are no cars allowed on Mackinac! 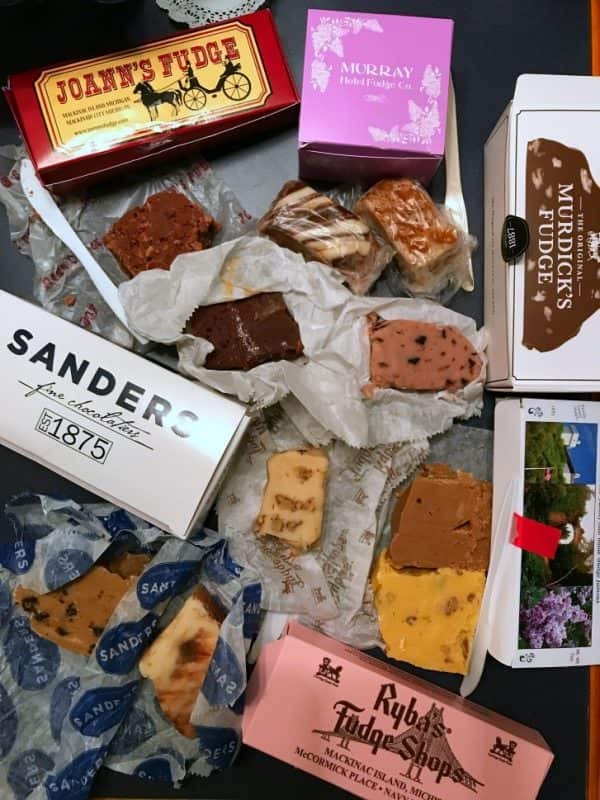 I feel like it’s my duty to tell you that we tried EVERY fudge shop on the island. No joke. And if you follow me on Instagram, you may have seen my obsessive ice cream posts! Our motto is ice cream should be enjoyed daily on vacation…and I’ll have you all know we succeeded! From Mackinac Island we headed to Traverse City for a couple days, and enjoyed the Sleeping Bear Dunes National Lakeshore. Having been to the Indiana Dunes as well as Warren Dunes I can tell you they don’t even compare to Sleeping Dunes. These dunes were huge…and they just kept going. We would climb one, only to see there was another. And another. Fortunately, we had gorgeous weather, and there was no burning of the feet while climbing barefoot! 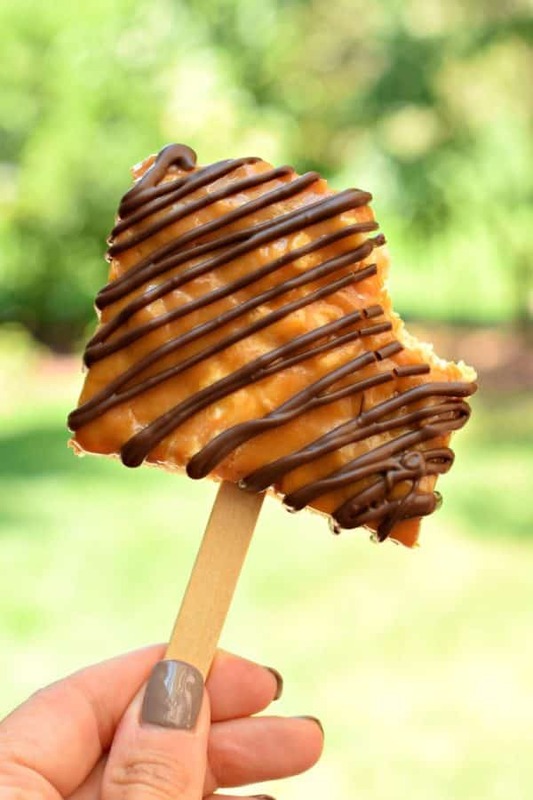 While in Traverse City we continued going to ice cream shops, and along the way we came across one that carried Caramel Covered Krispie Treats. And I knew instantly that I had to make these at home. As you all know I am a huge Rice Krispie treat fanatic. I have over 20 variations here and have perfected how to make rice krispie treats! That said, I did change it up a little bit from the original. 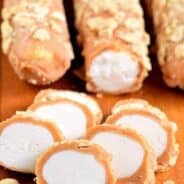 First, the ones we bought were completely wrapped in caramel. Which was good, except the flavor of the krispie treat was barely there. And since that, my friends, is my favorite part, I had to change it up! I made my Perfect Rice Krispie Treats recipe and added a little extra to fit into a 15x10x1-inch baking sheet. Once that was made, I melted down my caramels and spread it over the top. I let that set for a couple hours before slicing them into big squares. I separated the krispie treats and stuck popsicle sticks into them (totally optional). From there, I drizzle them with melted chocolate and added some mini M&M’s baking bits to half of them. These were so good I had to give them away or I would have eaten EVERY SINGLE ONE. 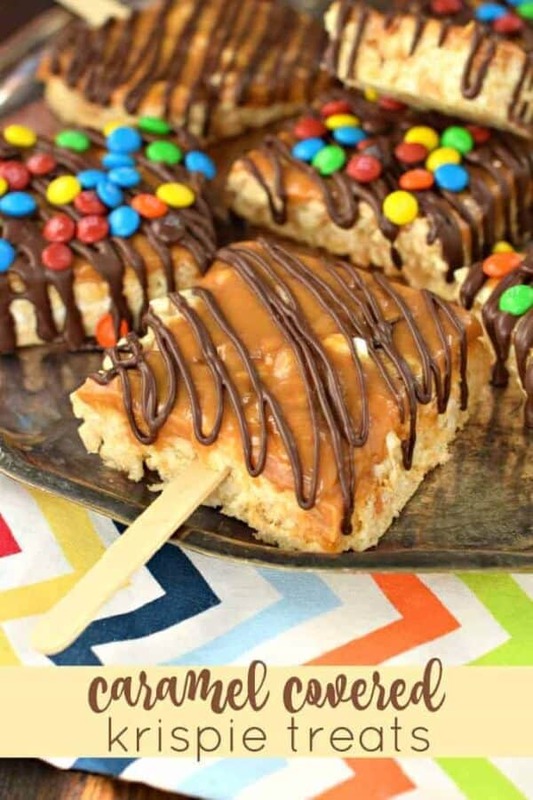 A batch of these Easy Gourmet Caramel and Chocolate Rice Krispie Treats would be perfect for a weekend get together, birthday parties, or even bake sale treats! I suggest you make sure to have plenty of friends to share with or you might find yourself indulging in too many at once, haha! ENJOY. Line a 15x10x1-inch baking sheet with parchment paper. Set aside. In a large saucepan, melt butter over medium heat. Once melted, add in all but 1 1/2 cups of the marshmallows. Reduct heat to low and continue stirring until completely melted. Remove from heat and stir in the vanilla. Add the cereal and reserved marshmallows. Fold gently until combined. Pour into prepared baking dish. Press GENTLY with your fingertips until spread out. In a microwave safe bowl, combine caramel bits with heavy cream. Heat for 1 1/2 minutes, stirring every 30 seconds until smooth. Spread over krispie treats. Allow to set about two hours. Cut into large squares. 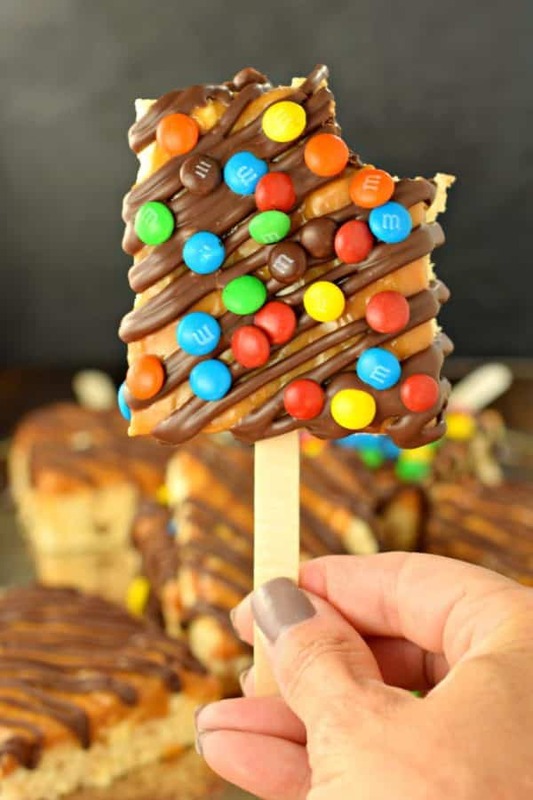 Separate onto a cutting board and slide popsicle stick into them, if desired, Drizzle with melted chocolate and add candy bits if desired. Allow to set about 15 minutes and enjoy! Store covered at room temperature. omg so much fudge! That sounds like the best vacation ever! 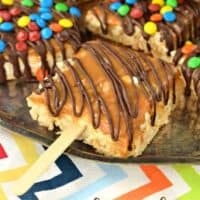 And these rice krispie treats look awesome; I love that they’re on popsicle sticks- that just makes them so much more fun! 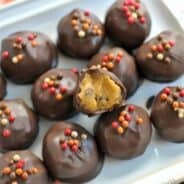 You got your inspo from kilwins didn’t you?!! Traverse city born and raised right here!! 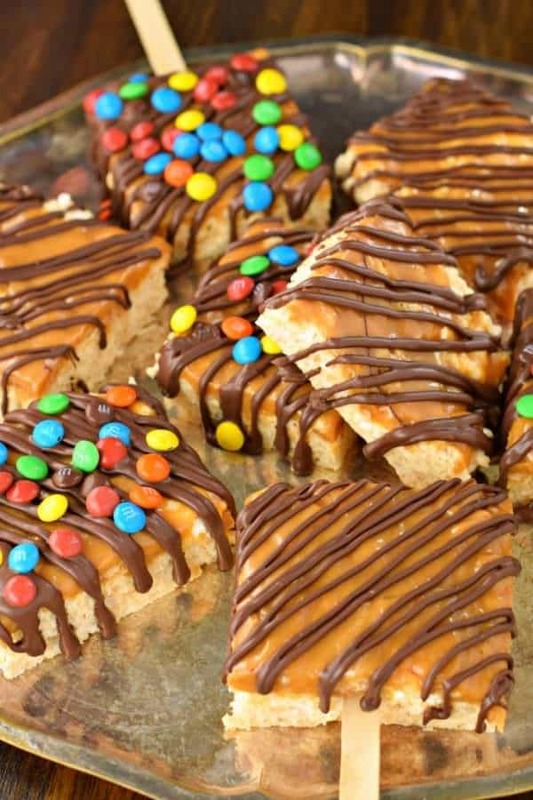 Would it be okay to use the Kraft caramel squares instead of the bits? I just think they taste better!